Ever one to consider radical solutions, Bartini spent part of 1959 scheming a giant marine vehicle called M. Seaborne at rest, this was to be able to rise from the water and fly at high speed over long distances.  It was to make true flights at high altitude, but also have the capability of 'flying' just above the sea surface. Such a vehicle was initially seen as urgently needed to destroy US Navy Polarismissile submarines, but it could have many other applications. The idea was refined into one called 2500, from its weight in tonnes, and ultimately designated M-62 or MVA-62. 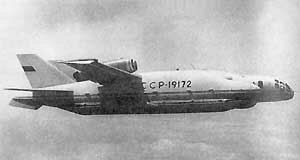 TANTK Beriev investigated stability, control and performance of the proposed configuration with the small Be-1. This looked vaguely like a jet fighter, with a front cockpit, large centroplan (central wing) with a turbojet on top, twin floats, outer wings and twin fins and rudders. Under each float was a surfacepiercing V-type hydrofoil, which was not to be a feature of the full-scale vehicle. 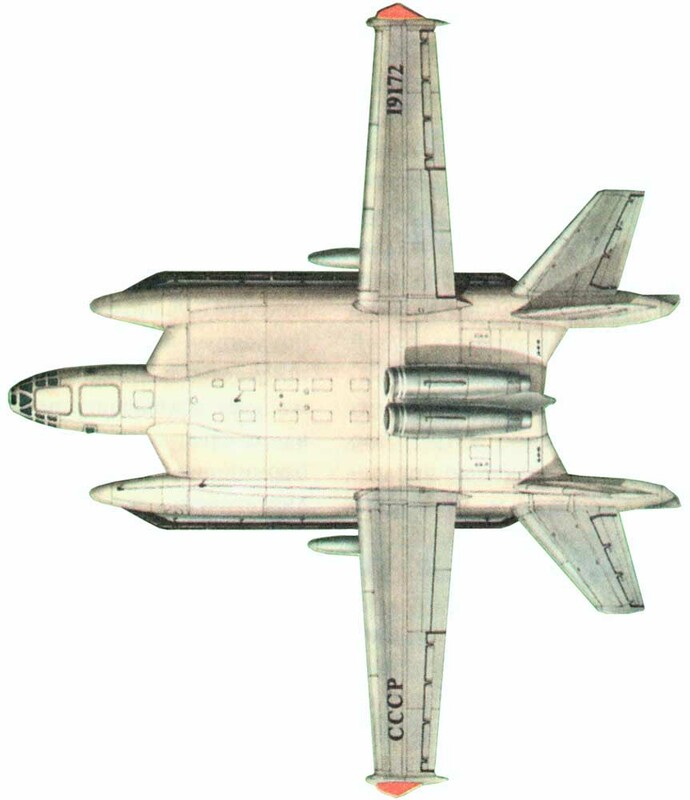 Pending funding for this monster, TANTK Beriev were ordered to build three VVA-14 prototypes, this being a practical basis for a multirole vehicle. Missions were to include sea/air search and rescue, defence against all kinds of hostile submarines and surface warships, and patrol around the Soviet coastlines. Production craft were to be kept at readiness on coastal airfields. The vehicle was classed as an amphibious aircraft. It was to be developed in three phases. The VVA-14M1 was to be an aerodynamics and technology test-bed, initially with rigid pontoons on the ends of the centroplan, and later with these replaced by PVPU inflatable pontoons (which took years to develop). The VVA-14M2 was to be more advanced, with two extra main engines to blast under the centroplan to give lift and later with a battery of lift engines to give VTOL capability, and with fly-by-wire flight controls. 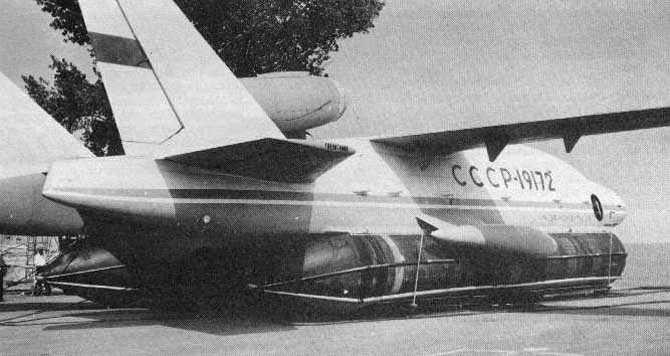 The third stage would see the VTOL vehicle fully equipped with armament and with the Burevestnik computerised ASW (anti-submarine warfare) system, Bor-1 MAD (magneticanomaly detection) and other operational equipment. 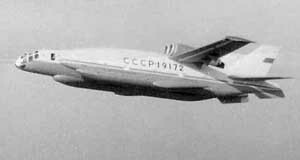 Following very extensive research, and tests with simulators, the first vehicle, Nol9172, was completed as an aeroplane. 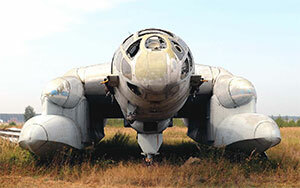 It was tested at the Taganrog WS flying school, which had a concrete runway. 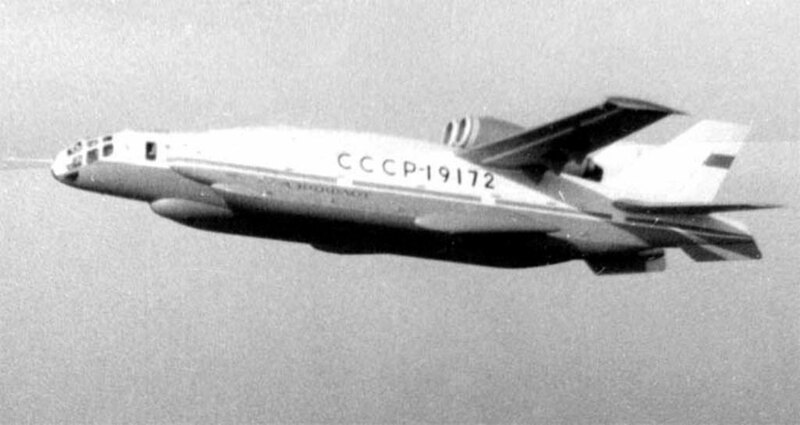 Accompanied by numerous engineers, including deputy chief designer Nikolai A Pogorelov, the test crew of Yu M Kupriyanov and navigator/systems engineer L F Kuznetsov opened the flight test programme with a conventional take-off on 4th September 1972. The only problem was serious vibration of hydraulic pipes, which resulted in total loss of fluid from one of the two systems. In 1974 the PVPU inflatable pontoons were at last installed, though their expansion and retraction caused many problems. Flotation and water taxi tests followed, culminating in the start of flight testing of the amphibious aircraft on 11 th June 1975. Everyone was amazed that Bartini was proved correct in his belief that the rubber/fabric pontoons would retain their shape at high airspeeds. On water they were limited to 36km/h, so later they were replaced by rigid pontoons, with skegs (axial strakes). The forward fuselage was lengthened and the starting (cushion-blowing) engines added. On the debit side, Bartini was also right in predicting that the Lotarev bureau would never deliver the intended battery of 12 RD-36-35PR lift engines, and this made the second and third prototypes redundant. Bartini died in 1974, and the now truncated programme continued with trickle funding. The blowing engines caused resonance which resulted in breakage of landing-gear doors and buffeting of the rear control flaps. The vehicle never flew again, but did carry out manoeuvre tests on water with reversers added to the blowing engines. 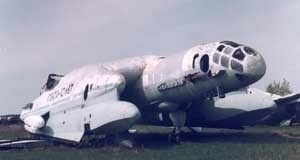 TANTK was given higher-priority work with the A-40, A-50 and IL-78. The entire structure was marinised light alloy, much of the external skin being of honeycomb sandwich. The airframe was based on the fuselage, centroplan of short span but very long chord, and cigar-like floats carrying the tails. Above the rear on the centreline were the two main engines. The starting engines were mounted on the sides of the nose, and the (unused) lift-engine bay was disposed around the centre of gravity amidships. On each side of this area projected the outer wings, with straight equal taper and thickness/ chord ratio of 12 per cent, with full-span leading-edge slats, ailerons and flaps hinged 1m (3ft 31/2in) below the wing. The propulsion and starting (cushion-blowing) engines were all Solov'yov D-30M turbofans, each rated at 6,800kg (14,991 Ib). The starting engines were equipped with cascade-type thrust deflectors, and later with clamshell-type reversers. 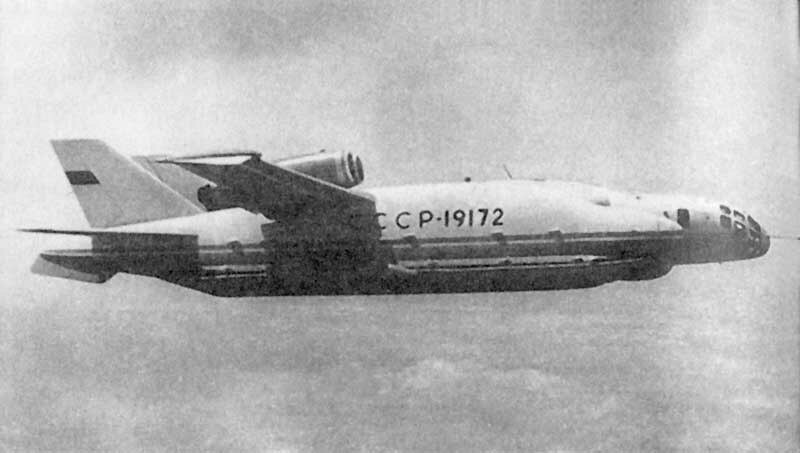 A TA-6AAPU (auxiliary power unit) was carried to provide electric power and pneumatic power. Bleed air served the cabin conditioning system and hot-air deicing of all leading edges. A total of 15,500kg (34,171 Ib) of fuel was housed in two metal tanks and 12 soft cells. The cockpit contained three K-36L ejection-seats, for the pilot, navigator and weapon-systems operator. Flight controls were linked through the SAU-M autopilot and complex military navigation and weapon-delivery systems. Had the aircraft undertaken VTOL flights the reaction-control system would have come into use, with six pairs of high-power bleed-air nozzles disposed at the wingtips and longitudinal extremities. 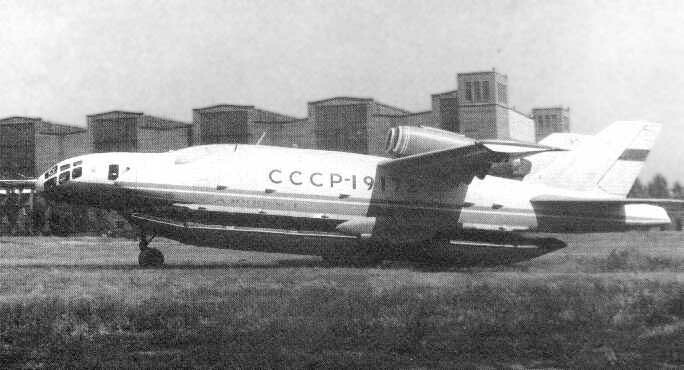 For operation from land No 19172 was fitted with the nose and a single main landing gear of a Tu-22, both on the centreline, and the complete outrigger-gear pods of a Myasishchev 3M heavy bomber. Maximum ordnance load, carried on IL-38 racks, comprised 4 tonnes (8,8181b), made up of AT-1 or -2 torpedoes, PLAB-250-120 or other bombs, various mines up to UDM-1500 size, RYu-2 depth charges and various sonobuoys (such as 144 RGB-1U). One of the incomplete VVA-14s was damaged by fire, the third being abandoned at an early stage. The one with which all the flying was done, Nol9172, was retired to the Monino museum in a dismantled state, where it carries the number '10687' and 'Aeroflot'. TANTK had various projects for intended production amphibious derivatives. These were grouped under letter T.
The VVA-14 was an outstandingly bold concept which very nearly came off. There is little doubt it could have led to a practical verhicle for many oceanic purposes. In the long term all it achieved was to give TANTK-Beriev considerable experience in many new disciplines, especially in challenging avionics and flight-control areas. Such a programme would have almost no chance of being funded today.